February was a big month in the debate about the possible role of vaccines in causing autism, a subject we covered in last year’s TV story, Autism: Searching for Causes, and several blog posts. The claim-–that there might be a link between the immunizations children receive and the onset of autism–-has recently taken some hard hits. 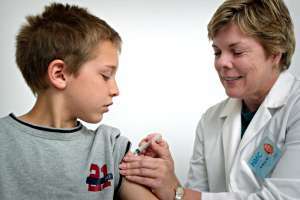 First, on February 1, two Philadelphia researchers published a scientific literature review that summarized a number of studies from around the world, all of which refuted the claim that there was a vaccine-autism link. Then on February 8, the news came out that the doctor whose 1998 research had sparked the initial autism-vaccine scare had manipulated his data. Finally, on February 12, a special federal court ruled against three families who argued that the measles, mumps and rubella vaccine had caused autism in their children, saying that the evidence was “overwhelmingly contrary” to the claims. No doubt there will be more debate about this issue in the future, as families and researchers continue the search for the cause. A book of recent past entitled “The Betrayal of Science and Reason” has many good examples of science by opinion of many vs science by scientific method. Autism remains mysterious and thus mysterious causes are rampant due to our need to understand and find cause. Manipulation of data is not unusual, but is not science other than the science of fraud.